Reputations, especially of an institution over a long period, are a minefield for dispute; even a correlation between reputation and influence may often be disputable. 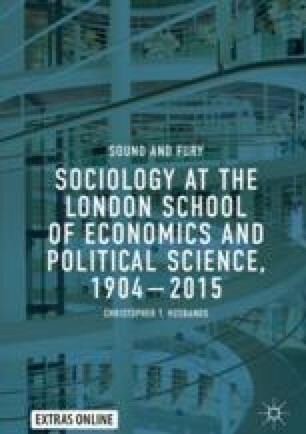 Certainly, LSE Sociology has long had a certain reputation in British sociology, but one derived heavily from of its being the first full higher-education teacher of the subject in the UK. When, before the 1950s, the University of London was the only UK institution offering a degree in sociology, and LSE was the most prominent among the University of London colleges and external institutions also teaching the subject, it was not difficult for it to be pre-eminent. That raises a number of questions: was its reputation justified when it was effectively the only institution teaching sociology, before others were available for any evaluative comparisons? If its reputation could be justified as in any sense positive, how far has this remained so? If there has been a decline, was this a sudden caesura or have there been undulating variations between periods of higher and then lower reputation? The online version of this chapter ( https://doi.org/10.1007/978-3-319-89450-8_9) contains supplementary material, which is available to authorized users.